LG Electronics has officially announced plans to launch five new Smartphones at CES 2017 in Las Vegas next month. LG had announced on December 22 to add new mid-range smartphones in its K-series— the K3, K4, K8 and K10, with the Stylus 3, which will comes out with a stylus pen. Although, the company hasn’t disclosed the pricing details of any of the handsets, they’re expected to range between $166 and $332. LG says that the 2017 K-series mid-range smartphones sport features such as a 120-degree wide-angle front camera lens and rear fingerprint scanner. 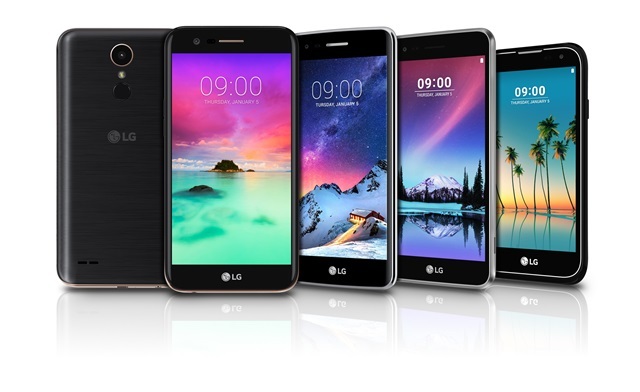 The company adds that the 2017 K-series smartphones have been designed with the ‘the diverse needs of consumers in mind.’ LG has confirmed the market availability will be announced locally in the weeks to come. LG may have detailed the phones, but it is keeping prices, release dates, and locations all under the wraps until CES starts early in 2017. Rumors put the release dates in January. We will be at the show, and will update you here when we get all the news. According to analyses done by Counterpoint Research, LG smartphones shipment declined 1.4 million in the 3rd quarter this year compared to last year. Since the major high-end smartphone market is largely occupied by Apple and Samsung Electronics. LG has decided to play in mid-priced smartphone market space, which could help it increase the sales in the industry.